First ever flight - and speechless! Paramotor pilot Geoff Bates made his first solo flight in the QuikR before Christmas at Kemble - and yes it was nearly dark as can bee seen from the lights in the photograph below! Very many congratulations to Geoff who travels from near Hereford to fly here at Kemble Flying Club. Gary Anderson from Malmesbury clearly enjoying his trial flight in the Eurostar. Congratulations to David Knight – two firsts in a week! 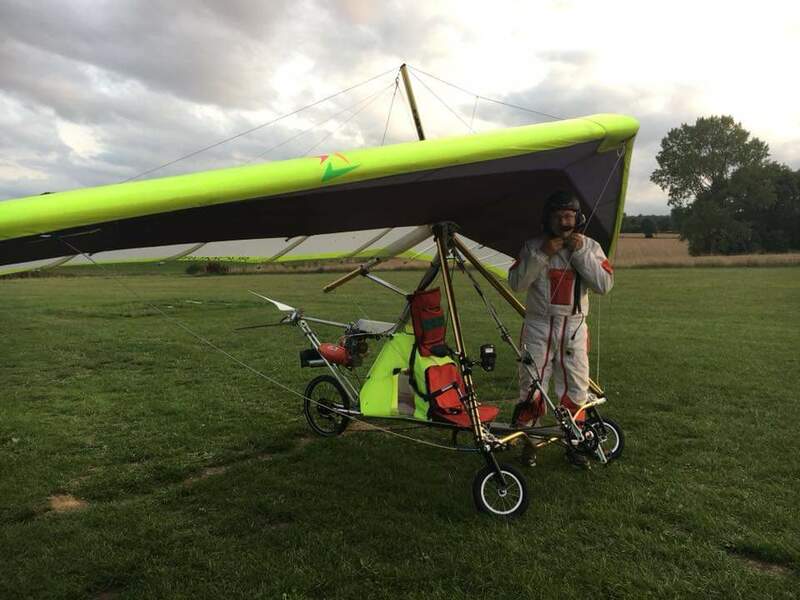 David Knight, another Club Member who has always wanted to fly since he was boy, achieved that amazing milestone, his first solo flight, on Wednesday 10th October in the Eurostar - and in the same week completed his first ever marathon run! Two big ‘firsts’ in a week and flying involved in both activities as David flew (airline flight) to Palma for the Zafiro Palma Marathon on Mallorca on 14th October. An obviously delighted David is pictured just ater his first solo flight with flying instructor Mark Hayter and holding the ‘First Solo’ strip completed in the Control Tower. The first solo ever in G-GRLS was achieved on Tuesday by William Cave after just 12 hours flying instruction! Very well done Will! He has dabbled with gliding since he was 16 so that helped him make this solo date. Our rather well known aircraft, build by girls at Benadean School in Kent, has been at Kemble for nearly three months now and covered over 100 hours instructional flying already. Will, 30, of Wotton-Under-Edge is quite at home with aircraft as for the MOD he looks after engineering and certification of our fast jet aircraft fleet! Mary-Jean Foxwell, 14, guides TeamEurostar FZ through a lovely turn at 3000ft today. Her flight was thanks to dad, Jim, who outbid all at a charity auction for people in poverty. Jim has already raised over £4k for the charity and departs shortly to Romania to assist with a build barn project. With him will be Kemble flying club member, David Hutchinson who sponsored the flight today. Many thanks David! Bill Brooks flying on a bicycle! It’s amazing what you see when out and about for a flight! Bill Brooks, P & M Aviation Chief Designer and Test pilot spotted at Clench common about to fly home on his bicycle!!! Chris Dayus flies for the first time! “Wow I’m at 4,000ft!” At the age of 55, Chris Dayus took to the air for the first time in his life today in Kemble Flying Clubs teamEurostar - and he loved it! Many thanks to his thee daughters for a fantastic birthday present! G_GRLS has new luxury seats meaning even 6ft 6” Joe West can fly her! Joe, an Aeronautical Engineering University student says he really likes the skyranger and prefers it to the C42 which is a theme coming from club members. First girl to fly G-GRLS! 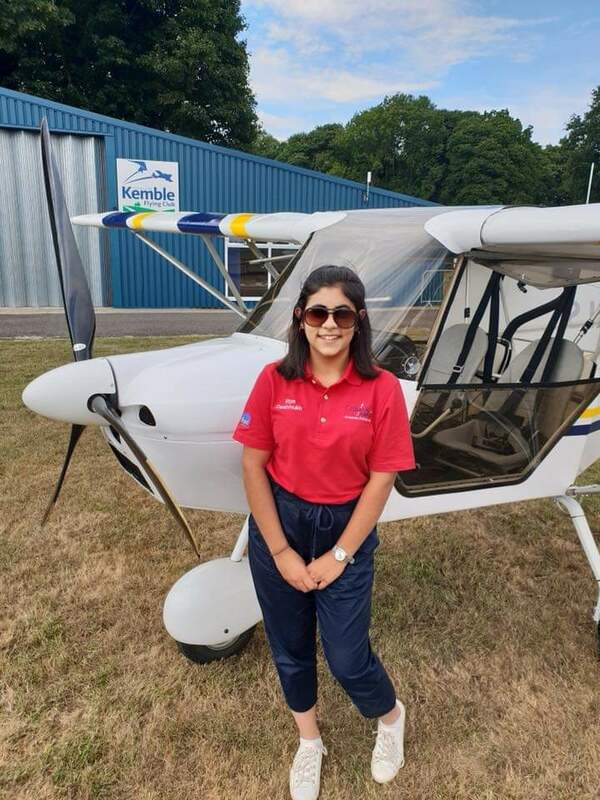 First girl to fly G-GRLS at Kemble flying club was Riya Deshmukh who is one of ten students currently taking part in the Cotswold Airport Aviation Scholarship.